Bijan Rafiekian leaves the FBI Washington Field Office in Washington, Dec. 17, 2018. Bijan Rafiekian, the ex-business partner of former U.S. national security adviser Michael Flynn, pleaded not guilty on Tuesday to charges he covertly lobbied for Turkey to discredit and extradite a Muslim cleric living in the United States. Rafiekian, a former director at the U.S. Export-Import Bank who worked on U.S. President Donald Trump's transition, was indicted on Monday along with a Turkish-Dutch businessman for undisclosed lobbying and for allegedly lying about their work. Rafiekian, 66, entered the plea at an arraignment in a federal court in Alexandria, Virginia, and is set to fight the charges at a trial starting on Feb. 11, court records show. The indictment alleges that Rafiekian and the businessman, Ekim Alptekin, worked with Turkish government officials on a secret plan to return Muslim cleric Fethullah Gulen, who is living in exile in Pennsylvania, to Turkey. Turkish President Tayyip Erdogan has blamed Gulen for stoking a failed coup against him in 2016, and has been pushing for his extradition for more than two years. The United States has rejected the plea, citing a lack of evidence. Rafiekian, a co-founder of the Flynn Intel Group, the consultancy at the heart of the lobbying case, has become one of the few people prosecuted for a rarely enforced law requiring that lobbyists disclose their work for a foreign power. Prosecutors contend that Rafiekian provided false statements to the Justice Department about his work, citing emails with Alptekin that appeared to show Alptekin was coordinating the $600,000 project with two Turkish government ministers. Former U.S. national security adviser Michael Flynn passes by members of the media as he departs after his sentencing was delayed at U.S. District Court in Washington, U.S., Dec. 18, 2018. The case against Rafiekian and Alptekin was built in part on information provided by Flynn, who has admitted to lying about his role in the lobbying effort and has been cooperating with the investigation of Rafiekian and Alptekin. Flynn was to be sentenced on Tuesday for lying to the FBI related to his contacts with the then Russian ambassador to the United States. But the judge in his case gave him the option of a delay so he could cooperate with any pending investigations and bolster his case for leniency. 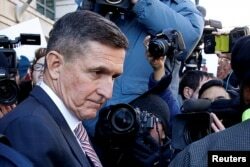 Flynn accepted the offer, and his lawyer said he was expecting to testify at Rafiekian's trial. U.S. District Judge Anthony Trenga, who will oversee Rafiekian's trial, asked prosecutors about the whereabouts of Alptekin, who through a spokesman denied the charges against him on Monday. Alptekin was believed to be in Turkey and was not expected to appear in court, a prosecutor told the judge, said a spokesman for the U.S. attorney's office in the Eastern District of Virginia, which is prosecuting the case.